중앙의 석가모니불(釋迦牟尼佛)을 중심으로 좌우 대칭되게 문수(文殊)·보현(普賢) 등 보살(菩薩)과 성중(聖衆)들을 빽빽하게 배치하였으며, 조선시대 불화 가운데 비교적 제작시기가 이르다. 이 그림은 인문 일파가 주도하여 그린 전형적인 군도형식(群圖形式)의 작품으로 본존을 에워싸도록 주위를 빙 둘러 권속들을 배치하였으며, 상단에는 부드러운 중간 색조의 황·녹·홍색의 색구름을 둔 뒤 나머지 여백을 짙게 처리하여 공간감을 부여하였다. 또한 주변 인물들의 크기를 위로 갈수록 작게 그리고 모두 본존불을 향하도록 함으로써 평면의 화면에 원근감을 나타냄은 물론, 예배화로서의 성격을 부각시키고 있다 하겠다. 주 색조는 적·녹색으로 담채(淡彩) 계통의 밝은 홍색을 많이 사용하여 조선 초기적 경향이 강하며, 각 인물의 묘사에 있어 부분적으로 다소 경직된 면이 있기는 하나 단순한 듯 세밀하면서도 세련된 필치를 보여 솜씨가 뛰어남을 볼 수 있다. 이 그림은 테두리 하단 중앙 부분에 먹으로 쓰여 있는 화기 중의 “강희사십팔년사월일(康熙肆拾捌年四月日) 신화성영산일부봉안우(新畵成靈山一部奉安于)…화사(畵師) 인문(印文) 민기(敏機) 세정(洗淨)…”이라는 내용을 보아, 강희 48년(숙종 35년)인 1709년에 인문을 비롯한 민기, 세정 등 불화승(佛畵僧) 3인이 참여하여 그렸음을 알 수 있다. 17세기 이후 크게 유행한 군도형식(群圖形式)의 전형을 보여주는 예로 조성연대(造成年代)와 제작자가 명확할 뿐만 아니라, 17세기 전반에서 18세기 초반에 이르기까지의 불화양식 흐름을 파악하는데 귀중한 자료이다. 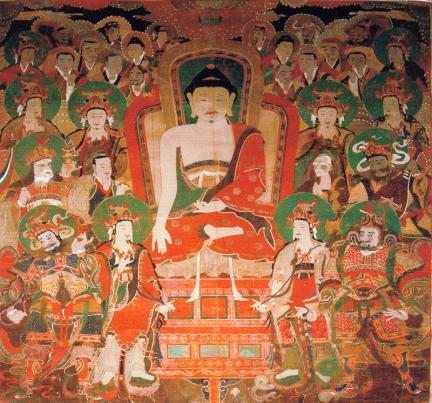 In this painting, the image of Shakyamuni Buddha is at the center flanked by Manjusri Bodhisattva and Samantadhadra Bodhisattva as well as other bodhisattvas and a multitude of people. This one was made earlier than the other Buddhist paintings of the Joseon Period (1392-1910). This is a piece typical of the paintings portraying a multitude of people prevalent in the 17th Century and thereafter. In this one, the Lord Buddha is surrounded by a multitude of attendants. At the top are clouds in soft shades of yellow, green, and red. The remaining margins are colored deep, thereby providing a sense of space. The figures at the top are made smaller than those at the bottom. All figures are turned toward the Lord Buddha. This way, the piece displays a sense of perspective while stressing its nature as a worship painting. This piece chiefly uses red and green colors along with light red, showing the characteristics of the paintings of the early Joseon Period. The portrayal of the figures shows slight rigidity yet refined and exquisite brush strokes. The statement written in Indian ink at the lower center say that it was made by three monk painters -- Inmun, Mingi, and Sejeong -- in 1709 (the 48th year of the reign of Emperor Kangxi of the Qing Dynasty of China or the 35th year of the reign of King Sukjong of Joseon). It is a precious material showing the trend of Buddhist paintings between the early 17th Century and the early 18th Century.